This structure of photoactive yellow protein, solved by time-resolved Laue crystallography, includes a 50-50 mixture of the ground state (top) and the light-activated state (bottom). When looking at proteins, much of the action happens at very small sizes and in very short times. This is particularly true of molecular reactions that involve light. Scientists have been inventing increasingly sensitive experimental ways to look at these tiny, speedy processes, and photoactive yellow protein (PYP) is one of the subjects they’ve been studying. PYP is a small, soluble protein found in purple sulfur bacteria, where it senses blue light. PYP is a perfect subject for study, since it forms large, stable crystals that diffract well, allowing us to get a detailed view of what is happening at the atomic level. The photocycle of PYP involves many separate, sequential steps that begin very quickly in femtoseconds, and end in about a second. 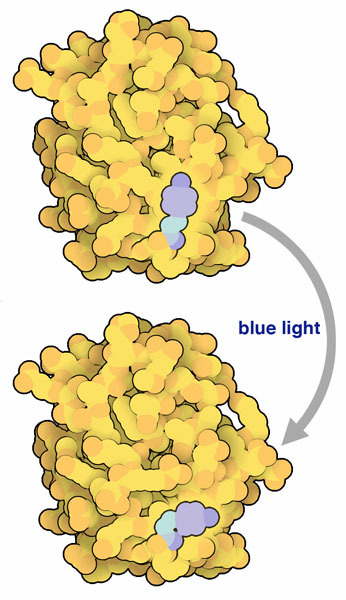 A light-absorbing chromophore in the protein absorbs blue light and switches from a nearly straight (trans) conformation to a bent (cis) conformation in less than a picosecond. This conformational change is then thought to activate other sensing proteins in the bacterium, which control the direction that the bacterium is swimming. Finally, the chromophore shifts back to the straight conformation in about half a second, ready to sense another blue photon. Because the light-activated state lasts for less than a second, it is tricky to observe by crystallography, so clever techniques like Laue diffraction need to be used. Usually, X-rays with a single wavelength are used for crystallography, and data is gathered by rotating the crystal and observing many diffraction patterns. In the Laue method, however, a stationary crystal is illuminated with synchrotron X-rays of many wavelengths at the same time. This produces a far more complicated diffraction pattern in which all spots diffract throughout the exposure, allowing collection of the data much more quickly. To determine the structure of PYP shown here (PDB entry 2pyp), a crystal was illuminated with blue light from a laser and then, after a time delay of several milliseconds, data was collected with a short burst of multi-wavelength X-rays. In this way, we can see how the chromophore and surrounding protein move after it absorbs light. The metric terminology for expressing shorter and shorter time intervals is commonly used when discussing these types of molecular transitions. Location of hydrogen (white) and deuterium (turquoise) atoms in a neutron diffraction structure of PYP in deuterated water. 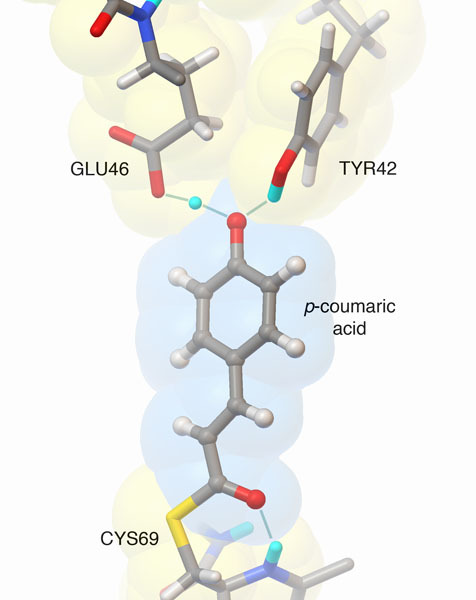 X-ray crystallographic structures of PYP have shown that the chromophore (p-coumaric acid, also known as 4'-hydroxycinnamic acid) is held tightly in the protein. It is covalently attached to a cysteine at one end, and it forms unusually short hydrogen bonds with two amino acids at the other end. To look at these hydrogen bonds more closely, researchers have used both X-ray diffraction and neutron diffraction to look at different aspects. X-ray crystallography sees the location of electrons in a structure, so it is useful for determining the location of heavier atoms, such as carbon, nitrogen and oxygen atoms. This is useful for measuring the length of hydrogen bonds, revealing that the two hydrogen bonds in PYP are among the shortest in the entire PDB archive. 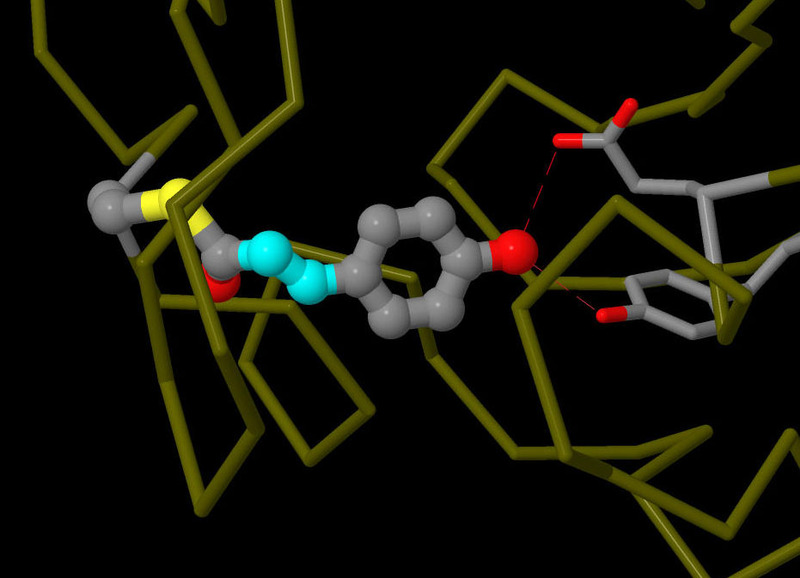 However, in most cases, X-ray crystallography doesn't allow us to observe the hydrogens directly. Neutrons, on the other hand, are diffracted by the nucleus of atoms, providing information on the location of hydrogen atoms. The PYP neutron diffraction structure (PDB entry 2zoi) revealed a very unusual arrangement, with a hydrogen atom shared between the chromophore and a glutamate. The researchers propose that this unusual interaction helps to stabilize the charged oxygen atom on the chromophore. Researchers are now developing ways to look at protein structures even faster. Currently, the fastest method is serial femtosecond crystallography. Tiny crystals of the protein are subjected to a very intense flash of x-rays from the Linac Coherent Light Source free-electron laser, which creates an instantaneous diffraction pattern and burns up the crystal in the process. Using this method, researchers have captured snapshots of PYP as the chromophore changes from trans to cis after absorbing light. The structure shown here was captured 100-400 femtoseconds after illumination. Click on the image here to view a movie of these amazing structures. Try searching for “serial femtosecond crystallography” to see other light-absorbing proteins that have been studied this way, including bacteriorhodopsin and photosystems. Many other sensing proteins have domains similar to PYP, collectively called “PAS” domains. For instance, try comparing the structure of PYP to one of the light-sensing domains of phototropin, PDB entry 2z6c.